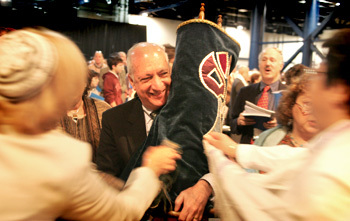 Our congregation worships God in the tradition of Reform Judaism. We are diverse, multi-generational, and welcoming of any person or family wishing to associate themselves with our Jewish community. We strive to cultivate a love our our Jewish cultural heritage and actively support the State of Israel. The spirit of Tikkun Olam (repairing the world) and a vibrant spirituality are ingrained within our congregation. Our many programs reach deep into the community, embracing all ages, faiths, races, and ethnic backgrounds. We work hard to insure our congregation family feels connected to each other and has many opportunities to share in the life cycle events of our congregants, as well as Shabbat and holidays. We make varied and interesting education opportunities available for both young and old, including Torah study, Adult Education, and Religious School. We invite you to look through our site, join us at an event, in learning, or at services, and see what our congregational family is all about.